To that end, I resurrected an old idea which I first built circa 1999 for randomly choosing someone from a list to make the tea. Not earth-shattering, but a bit of fun and simple enough for me to see through to completion. 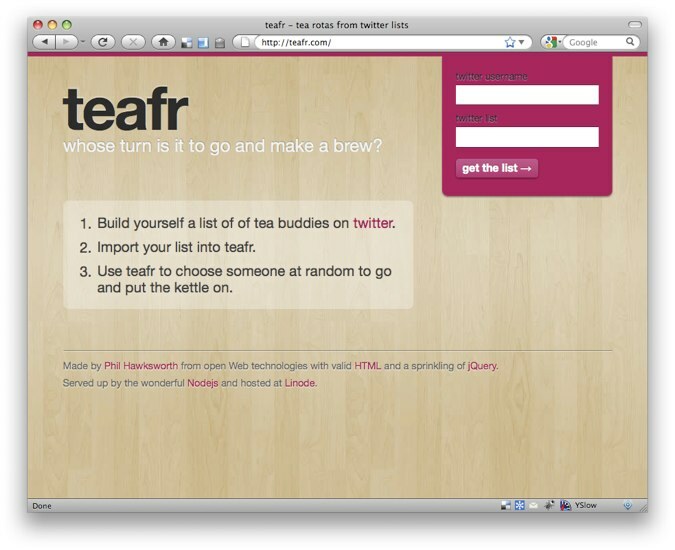 For this incarnation, dubbed Teafr.com, I piggybacked on the lists feature of Twitter to allow people to create and manage their lists of potential tea-makers somewhere they are already comfortable. My app would allow a user to recall a list of their choosing and then perform a lottery, selecting a winner (or loser) from the list at random. To add a little suspense (in the loosest possible sense) I added a basic animation which gradually got slower until the winner was revealed. I've been using Dreamhost for a while now and have to say that I'm pretty happy with them, but even with the great level of control and access to your server that they give you, you need a little bit more control to compile and run Nodejs. The easiest and cheapest way that I found to host Nodejs powered site was with a dedicated virtual server. There is no shortage of providers in this space and as Web developers get more sophisticated, the use of this kind of solution is getting more commonplace. I opted for Linode which is working out rather nicely for me, but equally, I could have plumped for a similar offering from Slicehost or Amazon Web Services.